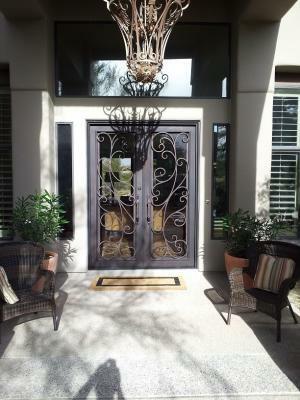 Custom built iron doors are some of the most rewarding projects. This customer in Gilbert Arizona wanted a design to match it their porch chandelier. Our Medina style was close and the client loved it, so our adept designers crafted this door for them. All of our doors are hand forged and timeless. Call us and come by our showroom to find out how your can have a custom built iron entry door to match your home.